Hello everyone! I am very happy to say that I have a new website and blog where you can buy patterns, finished friends and other fun projects. I have been planning to do this for a long time but have always put it on the back burner. If I would have known how easy it was to do on my I own I would have done it a long time ago. I hope you visit me there! Oh how I wish I had a little girl because I would literally make a million different outfits for her dolls from this great book created by Nancy Zieman and Joan Hinds. 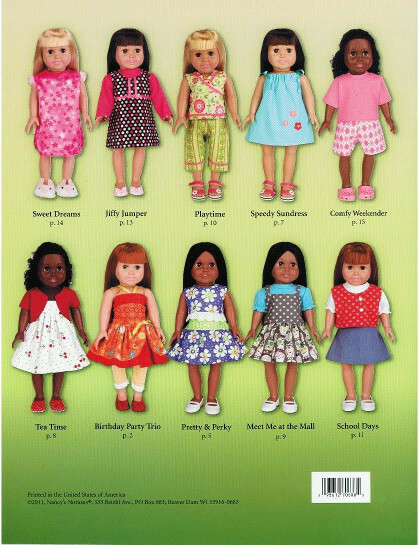 When I was a little girl, I remember my Mom sitting at her sewing machine and making doll and barbie clothes for me to play with. They were my favorites and I will always treasure those memories. 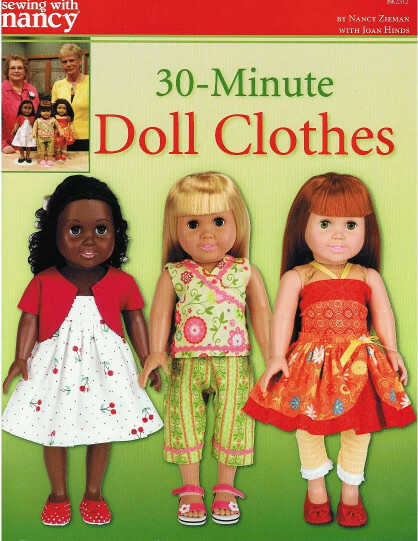 Thank goodness I have nieces that I know will love them - because I will make many more outfits from this fantastic collection. To be honest I was a little nervous and hesitant when I was asked to be a part of this blog tour. The clothes in the book are so darling that I thought that I could never make something so cute. I have never sewn a piece of clothing or anything that looks so put together and tailored. I am here to tell you that Nancy and Joan have made it so easy to make something to be proud of and in no time at all. One of the great things about this book is that you can mix and match the different pieces to make a million different outfits. You can also use different embellishments to make the different outfits special in their own way. Don't worry everyone, I know I'm an artist! Next, I decided to make my dress from a Riley Blake line called Millie's Closet. So cute. I finished the bottom hem of the dress with bright red pom pom's. I love pom pom's and can't get enough of them. Stop by all of the blogs on the list and you can win some great prizes. $25 Nancy’s Notions Gift Certificate from Nancy’s Notions Fun Prizes will be awarded to random readers at the close of the blog tour. 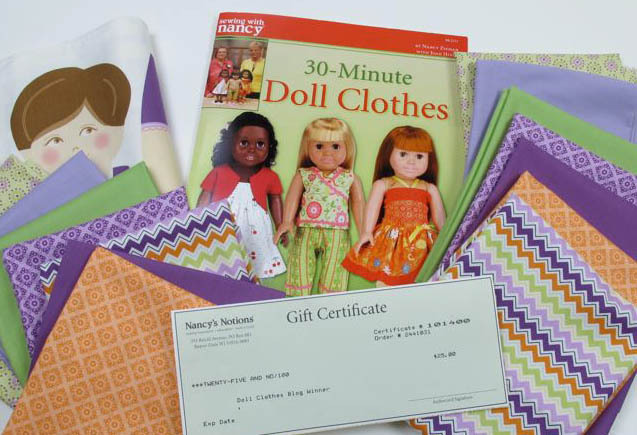 To be eligible for the following prizes, post a comment at the bottom of Nancy’s July 10 blog tour posting. Winners will be posted on Tuesday, July 24th. I have made some of my little friends up and put them for sale in my etsy store. If you know of anyone that is looking for a great gift let them know about it! I'm not sure how often I will be doing this, so take advatage while you can! If you would like to see what I have for sale click on my button that says "etsy shop." As most of you know I was a vender at the International Quilt Market last May. It was held in Salt Lake City which made it very convenient for me. I had so much fun and met alot of awesome people. I can't believe how much talent there is in this world. I know this is about 6 months late, but here are some pictures of my booth. I was lucky to have my Dad and husband close by because they built actual walls, laid down floring, but up baseboards, molding and hung pictures. It was so fun to see it all come together. I will definately be doing the Kansas City Quilt Market next May, but because that is so far away from where I live my booth won't be quite so great! I met an awesome store owner from Monument, Colorado named Angie. The store is called Crafty Laine. I have never been to her store but it sounds and looks awesome. She carries all of the best fabrics, patterns and quilting needs. It is a little boutique where you can go get what you need and also learn how to sew. Here is the blog to her awesome store: craftylaine.com/blog. Whenever I sew my little friends together I always take the time to change the thread in my machine to match the fabric that I'm sewing. You can see the stitches because you aren't tucking in the seams. I thought it was important that the thread match. Well, Angie bought some patterns from me and told me that she would make her own store samples. She explained that she would only use one neutral color of thread to save time and for some contrast in the finished project. I didn't know what to think or how it would look. A couple of weeks ago I gave it a shot. Let me tell you - I can't believe the time I have wasted by changing the thread for every fabric change. Hours upon hours! I love the neutral color and the way my finished projects look with the contrast. 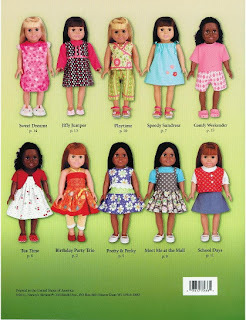 If you have bought one of my patterns in the past, try choosing a neutral color of thread to sew the project together. I have been going for alot of cream - it seems to work well with most fabrics. I have still been using black for the pupils and cream or white for the white of eyes. I am changing all of my pattern instructions to include this suggestion. Try it. You will thank me as I think Angie for the time saved! So, as you can tell I am not the best blogger. I need to get better about it, but being new to blogging I have a little anxiety about it. I promise I will get better. I am so pleased to introduce you to Lee Lee the Lion. I love this fun little friend - he (or she) bring a smile to my face because when I look at him he just seems so happy. Does that sound weird? Probably. 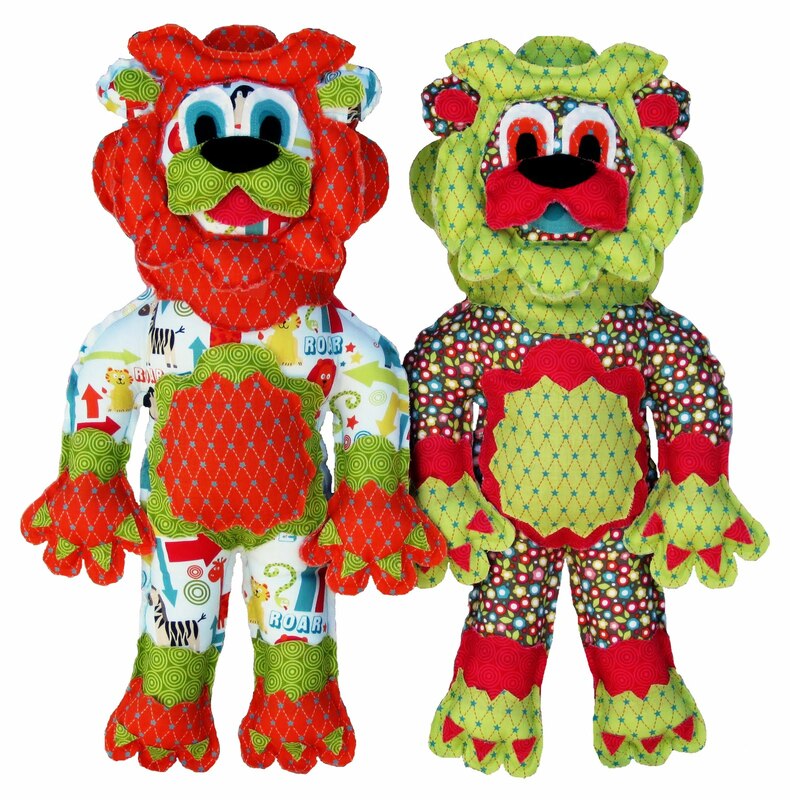 This fun guy is darling as a boy or a girl and can be made in any fun fabric. You will be seeing the pattern pop up on various online stores (Fat Quarter Shop has it now) as well as in local quilt shops around the country. This is made from Lila Tueller's fun new fabric line Lola's Posies. She is a designer that works with Riley Blake Designs. Lee Lee is named after my youngest sister Liesl. I have always called her Lee Lee and was so excited to name my newest pattern after her. Anyone that knows Liest knows what an easy person she is to get along with and be around. I love her to death and think that she is one of the best people I know. Even though I am 11 years older than her we are such close friends and know that she always has my back. About 10 years ago we I moved back home after being gone for many years. Liesl and I were the only kids living back at my parents house. We did everything together and were closer than ever. Sometimes I wish I could go back in time and relive some of the great memories I have. Love ya Lee Lee! Finished size: 20" X 4" X 12"
Fabric in this picture is "Alphabet Soup" by Riley Blake Designs. I will post more pictures of Lee Lee later. 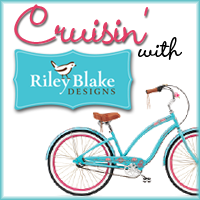 Cruise on over and read about the details of their contest and the awesome prized that they are giving away! Ever since I started getting into the quilting industry I have heard of the Quilt Market. When people talk about it they get so excited like it is the funnest thing on earth for people that love fabric, sewing and quilting. The Quilt Market happens twice a year - once in the Fall and once in the Sping. In the Spring, it travels to different cities each year and the Fall market is always in Houston. This May it is coming to Salt Lake City. I'm so happy because this makes it so much easier me to be a vendor since I live here. This will be my first year and I am so excited because I think that it will be great exposure for my business. It is not open to the public. Quilt store owners from over the world travel to see all the new fabric and pattern designs. Keep your fingers crossed for me and hope they like my designs! Right now I am frantically getting ready for my booth. I still have 9 weeks, but time keeps flying by. It seems like just yesterday I had 20 weeks left. I have to design my booth and think of a good way to display the samples I am making to show people. I am sewing like a maniac and writing 2 new patterns. It is all very nerve wracking but I am loving every minute of it. 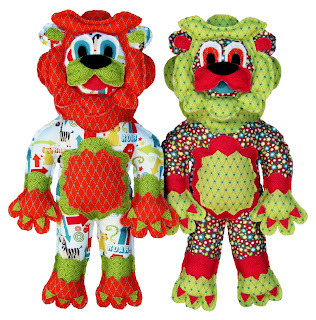 This is my story about creating softie/toy sewing patterns. I hope that you enjoy them as much as I do. 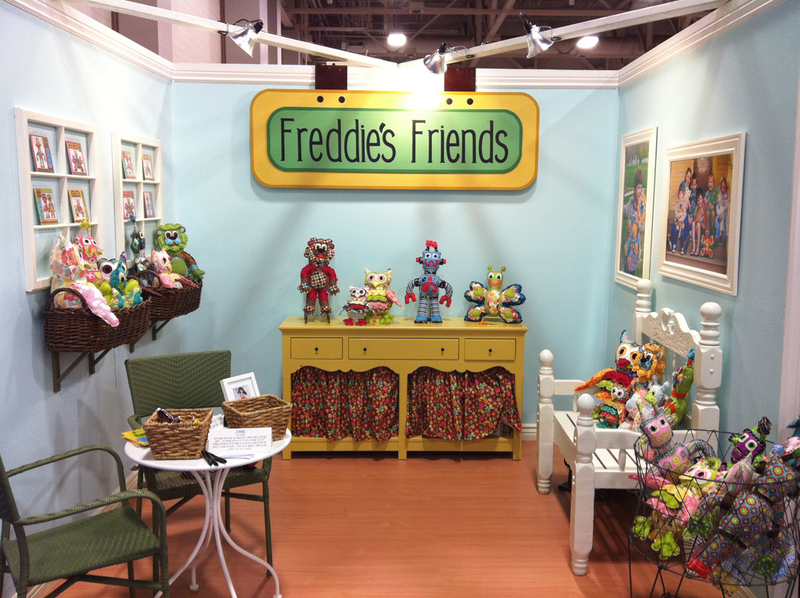 If you need to contact me please email me at freddieandcompany@gmail.com.